Critical Aspects to consider after an Assembly! Gather together the documentation of the assembly (resolutions for action, notes, video, etc.) and create a synthesis of what happened at the assembly. Categorize the information and produce representative statements and plans of action that can be easily understood by people who did and people who did not attend the assembly. Make this synthesis readily available to all who attended the assembly and to organizers of other assemblies. 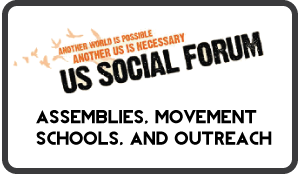 Contact all of the organizers and facilitators of the small groups to debrief the assembly and the action steps. Organize large or small meetings or speak with people individually to think through these questions and others that are relevant to the assembly: What resulted from the assembly? What were challenges? What next steps need to be taken? Gather the documentation from the small groups and from the note takers / videographers. Create short videos and written documentation of the event. 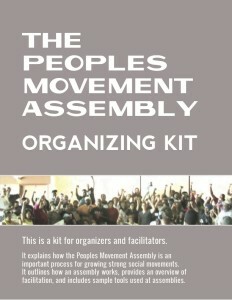 Post audio, video, and print documentation on the Peoples Movement Assembly website and consider creating a website for the assembly. Contact those who participated in the assembly to ensure they continue their involvement. Activate people and organizations committed to involvement in action steps. Ensure that there are clear ways for others who did not attend to be a part of implementing the plan and developing next action steps. Look over the feedback from the organizers and facilitators and from the participant evaluations. Think through the challenges that were faced and the accomplishments that happened. Keep in mind the goal of building social movement power and constructing plans for governance. Evaluate the assembly and determine the next steps in the organizing process.